Opposite the ruined cinema that Hitchcock is said to haunt in Walthamstow, another ghost has taken up residence in Ye Olde Rose and Crown pub. Phantom is being performed here upstairs for the next week, though this is emphatically not the Andrew Lloyd Webber version which has possessed Her Majesty’s Theatre in the West End for the last 27 years. Similarly adapted from the Gaston Leroux novel, this version has songs by Maury Yeston and Arthur Kopit, the Tony award winning duo behind the hit Broadway musical Nine. You have to admire the devil-may-care attitude of All Star Productions in taking on the world’s most successful stage musical with a rival interpretation in a tiny 60 seat auditorium with no budget whatsoever. And it would be very mean-spirited to say that the results look a bit on the cheap side when you can hint at having front row seats for Phantom in London for only £15. So out goes glossy production, the bombast and the da-da-da-da-daaaaa theme and in comes a spritely retelling and a subtler score that is more of a musical melodrama than a histrionic pop-opera. The bare bones set and lack of special effects means the actors shoulder the whole show here and the experience therefore stands or falls on their performances alone. Luckily, Kieran Brown and Kira Morsley in the two lead roles are full-blooded and sing with both passion and skill, although their Beauty and the Beast style relationship is perhaps under-developed and unconvincing as a love story. On the plus side, this staging has a real sense of intimacy and gusto – and Pippa Winslow gives a crowd-pleasing turn as the villainous Carlotta. On the minus side, several numbers fall flat (the picnic in the woods was wooden) and a few of the minor characters lack any real sense of definition. The low-rent costumes are also distracting at times with the Phantom’s mask making him look more like Kung-Fu Panda (please – spray it black). This is a small production with a lot of heart that should please people who prefer music over spectacle. Entertaining as it is however, there is still some way to go to uncover the two extremes inherent in the original story: the romance and the horror. Perhaps they should invite the ghost of Hitch in from over the road to help with that. 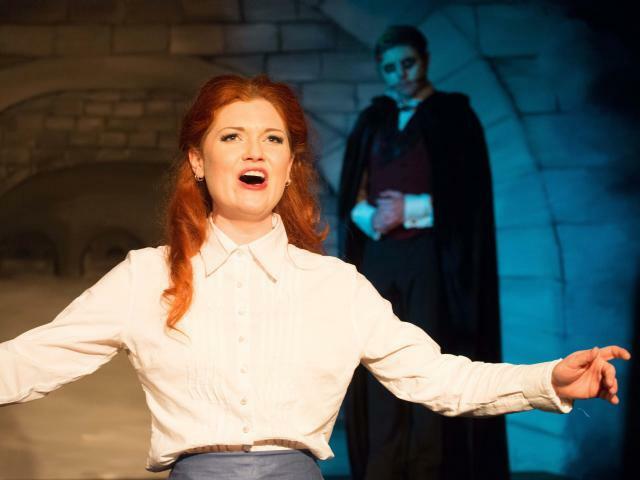 Phantom is at Ye Olde Rose and Crown, 53 Hoe Street E17, until 31 May. Tickets £15 / £12.50. For more information see the All Star Productions website. Londonist saw this show on a complimentary press ticket.